The above image from Mobility Today is self explanatory, isn’t it? 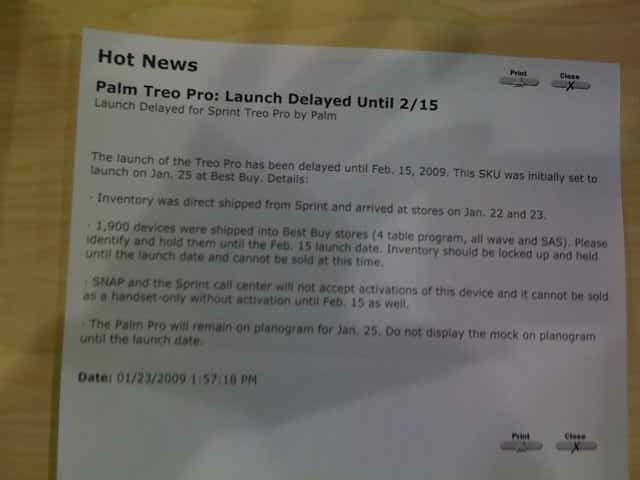 The Treo Pro has been delayed until February 15th according to a Best Buy Mobile employee. That stinks considering the fact that they’re in stock right now and were supposed to go on sale tomorrow. No word on whether this affects Sprint sales as well. Something tells me that it will since the BBM Treo Pros can’t be activated until the 15th. But I could be wrong. And who cares with the Pre coming in a month or two or three or five according to Sarah Lacy.